Pieces of wonderful: All about tape..
And there goes another Sunday..but my what a beautiful sunny Sunday it has been. How was yours? I spent some time tidying my garden today and now everything looks a bit spring like..a little less soggy and brown from months of winter so now there is much to look forward to..
My weekend in general has been rather lovely, what with all the sunshine, a fabulous time spent at the theatre yesterday and some time spent meeting Zach Braff himself (though not one on one I should say)..quite a big deal for me considering he has been one of my actor crushes for about 12 years...but enough about that. Anyway, readers, I have a new obsession! 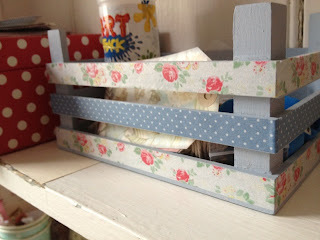 Have you discovered the wonder that is patterned masking tape?? Yes? No? 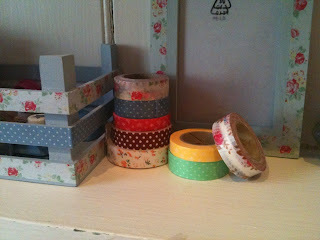 Some of you crafters may know the brand 'Washi Tape', I have never used it myself but the idea is much the same. Think masking tape, think pretty patterns..think possibilities. I picked up some Cath K patterned masking tape some time ago, it was on sale and it looked cute so I grabbed it...months later and I am sitting painting some mini wooden storage crates for my shop and I'm thinking 'this needs something extra'..and then it came to me! 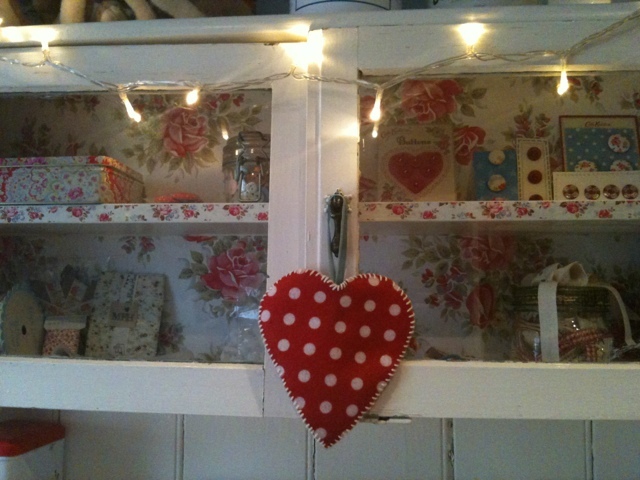 I stuck the masking tape to the wood and oh my, the result was lovely. What you are left with is what looks like a really fine paint job but it is, in fact, tape. I was so excited by the result that I invested in a variation of tapes and have since found a plethora of items to decorate in time. My tape collection, growing slowly. Sadly, it seems that Cath K no longer has the tapes on sale but I was lucky to pick up a second pack from ebay. 'My fabric house' also have a lovely stock of fabric tapes which are very similar to the masking tape and full of just as much potential. I have been busy decorating everything in site with my tapes, including photo frames and more mini crates. But one of the most exciting realisations has been that the tapes make the most wonderful decoration for shelf edges as modelled beautifully by my craft room cabinet..
A really simple yet beautiful effect that gives that added detail to your furniture, accessories and trinkets...of course this tape can also be used for gift wrapping, card making and scrap booking if you see fit..but I think some of the possibilities are far more exciting than that! For my next trick, I will be decorating plastic Easter eggs with floral tapes! It doesn't get any more spring like than that. So there you are, new obsession shared! 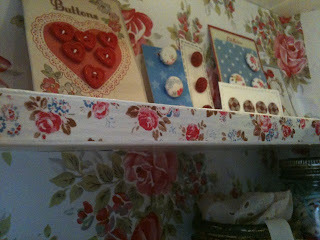 I will be back soon to tell you all about a favourite shop of mine that I revisited yesterday..you'll love it!